If you like Canada's favourite pass time and you are a proud Montréaler or Torontonian you are going love my collaboration with my friend and fellow artist Jono Dorion. 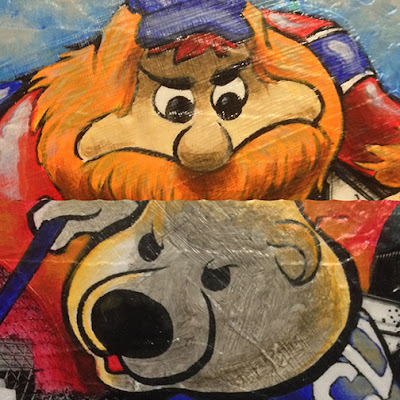 We collaborated to create two panels that take the rivalry between Montréal and Toronto to a whole new level. Mashing together the monster movies of old with Canada’s favorite pass time, they managed to fuse their distinctly different styles together into two unique works of art titled ‘Montréal Mayhem’ and ‘Toronto Terror’. The artists will each exhibit one of the pieces in their individual booths (booth #529 and #809) at the 10th edition of the Artist Project, one of Canada's largest curated contemporary art fairs to be held at the Better Living Center in Toronto from February 24-26. Although they each work in a distinctly different style and technique, their work belongs in the realm of contemporary art. Denise Buisman Pilger works with photo based mixed media techniques, creating sprawling cityscapes and highlighting forgotten and ignored urban elements. Jono Doiron revisits childhood influences of cartoons, comics and animation, revealing truth into jokes and bridging elements of the mundane into fantasy. Combining their styles in these two pieces feels more natural then it might initially seem. The artists are looking forward to finally revealing this collaboration at the Artist Project 2017. Denise Buisman Pilger will exhibit ‘Montréal Mayhem’ in booth #529 and Jono Doiron will show off ‘Toronto Terror’ in booth #809. The Artist Project runs from February 24 to 26, 2017 at the Better Living Centre, Exhibition Place in Toronto, for more information visit www.theartistproject.com. The Artist Project, Better Living Centre, Exhibition Place, Toronto, ON. 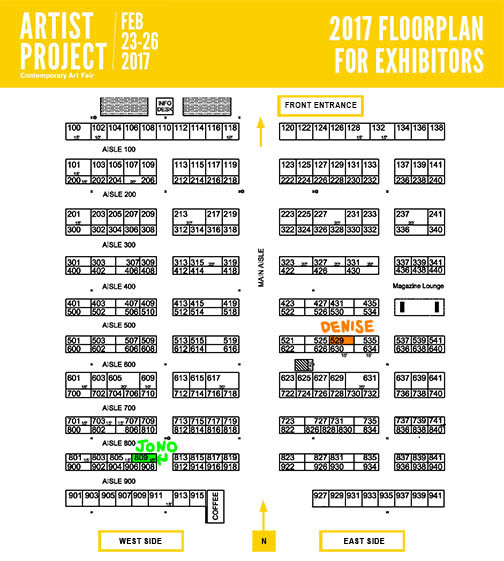 Come See Me in Booth 529 at Artist Project 2017! 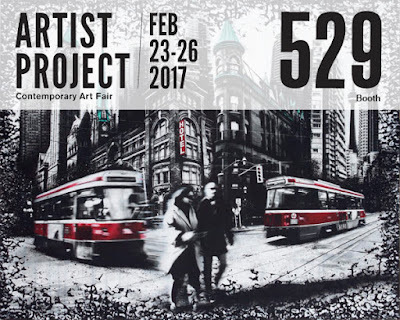 Next week I will return to Toronto to exhibit my newest artworks in booth 529 at the Artist Project! This upscale art event will be held from February 24 to 26, 2017 at the Better Living Centre, Exhibition Place in Toronto. Buy your tickets online now and use the promo code TAP10YRS for a special discount! You can check out my artist profile here. The Artist Project features the work of the 250 top contemporary artists from Canada and abroad. Visit the installation zone and explore large-scale sculptures and conceptual art and check out the 'Birthday' Artist Competition, in honour of the fair's 10th anniversary. This theme will explore the idea of a birthday party, sharing memories, and celebrating these special moments in our lives. Visitors can vote in the People’s Choice Award for their favourite entry and be automatically entered to win a $250 towards a work of art and a pair of tickets to the Opening Night Party at Artist Project 2018! 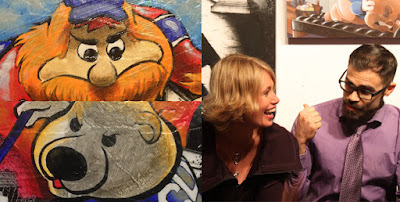 Special artist collaboration takes rivalry between Montréal and Toronto to a new level! 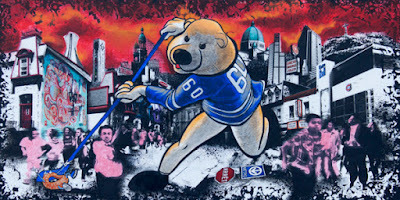 Denise Buisman-Pilger and Jono Doiron – two Montreal based artists, collaborated to create two panels that take the rivalry between Montréal and Toronto to a whole new level. Mashing together the monster movies of old with Canada’s favorite pass time, they managed to fuse their distinctly different styles together into two unique works of art titled ‘Montréal Mayhem’ and ‘Toronto Terror’. The artists will each exhibit one of the pieces in their individual booths (#529 and #809) at the 10th edition of the Artist Project. The artists are looking forward to finally revealing this collaboration at the Artist Project 2017. Denise Buisman Pilger will exhibit ‘Montréal Mayhem’ in booth #529 and Jono Doiron will show off ‘Toronto Terror’ in booth #809. Getting ready for the Artist Project 2017! Wow! it's February already! How did that happen?! I have been super duper busy in the studio, creating so many new paintings, all in preparation for the upcoming Artist Project! time flies when you're having fun! I am really excited to share all these new pieces in my booth at the Better Living Centre in a couple of weeks. The Artist Project will from February 23-26, I will be showing off my new pieces in booth #529! For anyone who would like to attend this amazing show you can get a nice discount if you buy your tickets online using discount code TAP10YRS. If you have been following me on Facebook and Instagram (TheArtistAbroad) you may have seen some sneak peeks at a very special project I have been working on together with my friend and fellow artist Jono Doiron (you can find him in booth #809 at the Artist Project). 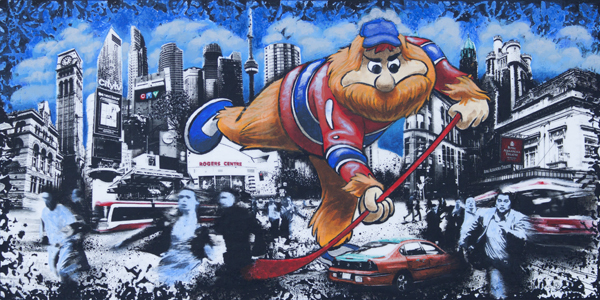 We created two pieces, playing around with the rivalry between Montréal and Toronto. 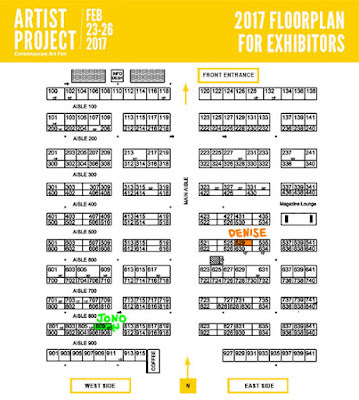 Both pieces will finally be revealed at the Artist Project, one in each booth (see map below). We had a lot of fun collaborating on this and we're very excited to finally share out project with the world!